What is FroliCat Bolt Interactive Laser Toy for Cats? The FroliCat Bolt Interactive Laser Toy for Cats is an automatic laser toy that will entertain your cat for hours. Either hold the FroliCat Bolt Interactive Laser Toy for Cats or place it on a smooth surface and watch your cat pounce and run around trying to catch the laser. The FroliCat Bolt Interactive Laser Toy for Cats is adjustable so it can be used on multiple surfaces, and takes 4 AA batteries (not included) and has a timer, so you don't have to worry about turning it off. Do not aim directly into your pet's eyes. Always supervise your pets when playing with toys. This product is intended for pets and not for children. Do not allow small children to use this product without adult supervision. Inspect his product periodically for damage and discard it immediately if it appears worn or broken. Locate battery door on the bottom of the product. Open the battery door and place the batteries inside being sure to match positive and negative sides. After completion, close the battery door. 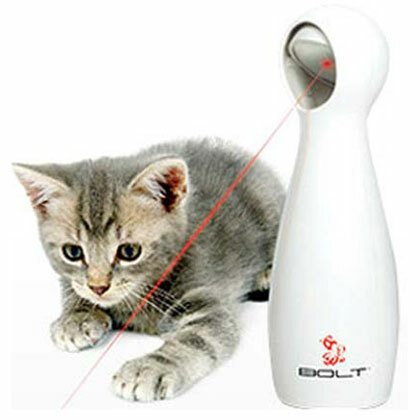 Hold the FroliCat Bolt Interactive Laser Toy for Cats in your hand if you want to play with your cat. Made with plastic. Use 4 AA batteries.